Some new bonsai pots came to me from Hidemi Kataoka (Shuuhou), the bonsai potter of Tokoname recently. When I opened the parcel and saw them, they took my breath away. Some pots were almost like jewels, another was a work of art. If you got such fabulous pots, it would be hard not to show them everyone. Well, let’s see! This oval pot is so fabulous that you can appreciate it just as a piece of art. 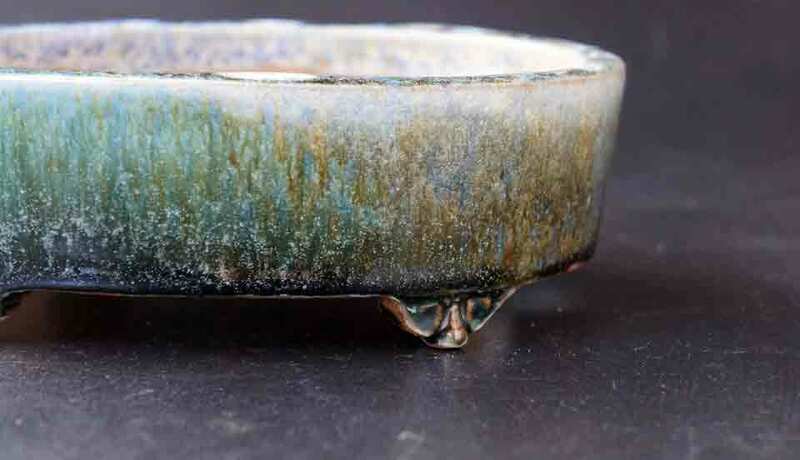 The glaze is translucent and has a beautiful smooth gradation of the deep green, blue, yellow and white color. Around the edge, the covering with white glaze shines beautifully in the sun. I think any deciduous tree would look fantastic with the glaze. 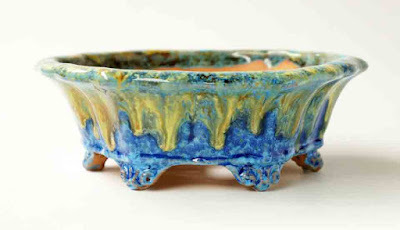 This one with a covering of several colors of glazes is also a wonderful piece. 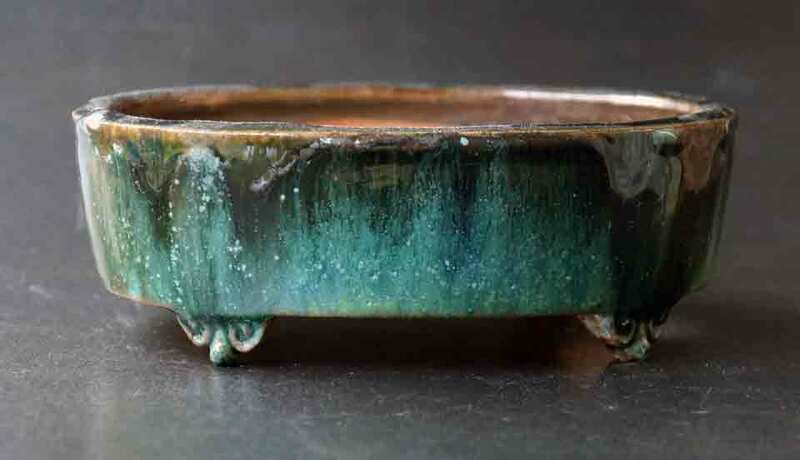 The running deep green glaze on the white makes the unique patterns and they look like the shape of mountain range visible in the distance. I hope someone gets this pot and puts in a nice tree that would suit it very well. The last one is very colorful. 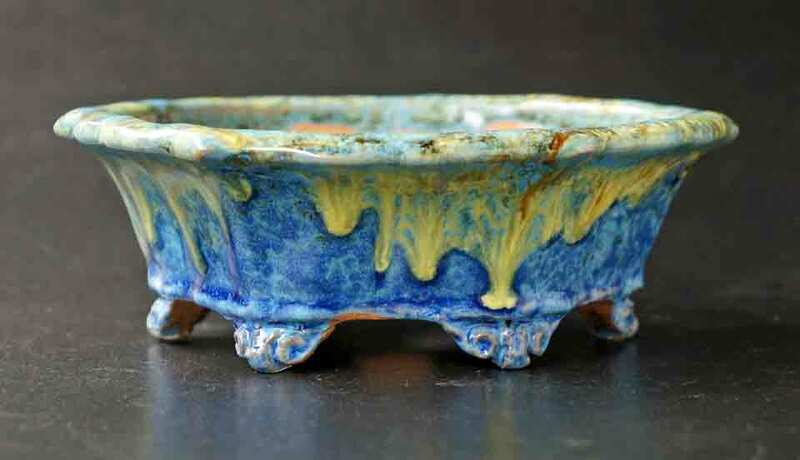 I am not sure whether everybody would like it, but I like it very much, especially the flowing patterns with the yellow glaze. Don’t you think that it reminds us of the famous picture, ‘Starry Night’ of Gogh? I understand what they may say, however, this beautiful pot came out of the challenge undertaken by the potter, therefore we, the users, may make more effort to pursue the best combination of plants with such a pot. I do hope you who will be lucky enough to have this pot in your hand, and to enjoy planting with it in your style. 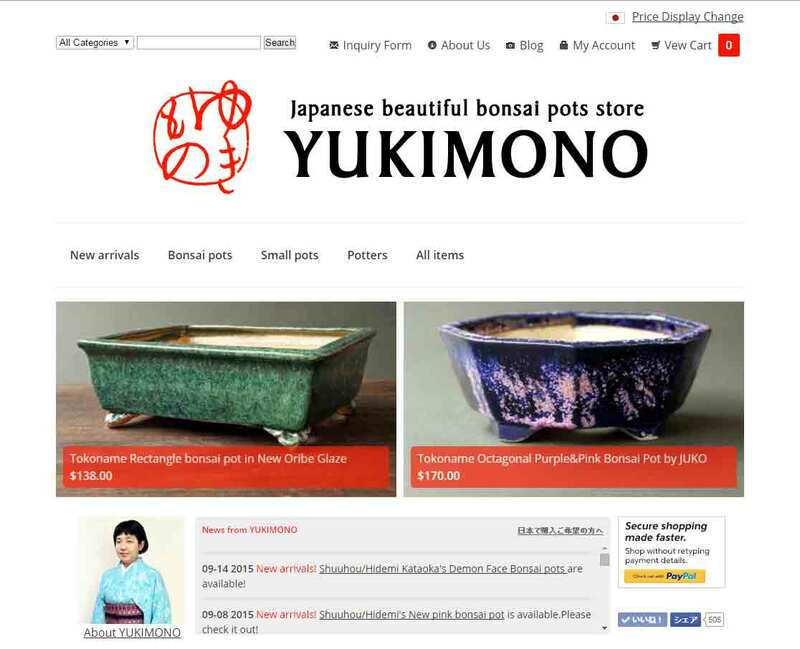 All pots in this post are made by Hidemi Kataoka (Shuuhou) of Tokoname and they are available in YUKIMONO online store.Please come to see them!